To some people summer means flip flops, to others it means white dresses, and to some it's all about the espadrilles. Today we're looking at some fantastic flat espadrille options that are colorful and great for summer. I mean hello? Abstract stripes in a killer combo. And under $50. Yes, you read that correctly. J Crew shoes for $50. And in a highlighter poppy color. Gorgeous. Leave it to Nicole Richey to take the espadrille to a whole new level. Studding, embroidery, metallic. Amazing. What if you just want a go to, neutral? These suede beauties will do just the trick. 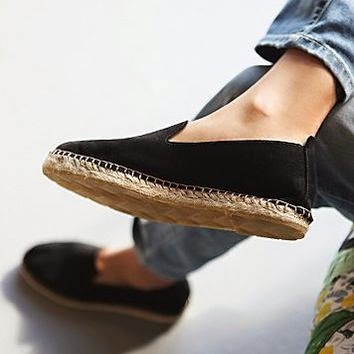 I love a flat espadrille for summer because they're casual and comfortable and I can wear them knowing 9 out of my 10 toes have chipped polish.